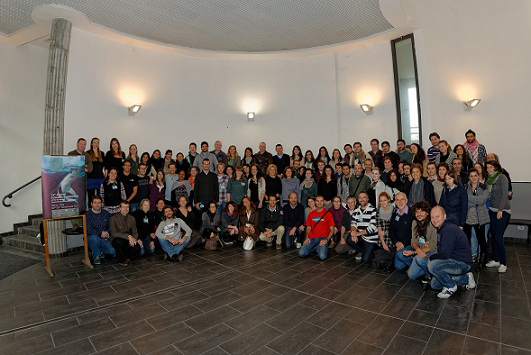 The 16th Annual Scientific Conference was hosted by the Italian Science Group on Chondrichthyan Fishes (Gruppo Ricercatori Italiani sugli Squali, Razze e Chimere, GRIS) of the Italian Society for Marine Biology (SIBM) from 22-25 November 2012. More than 120 delegates from 21 countries attended this year’s EEA conference in Milan, some coming from as far as the Sudan, Brazil, and Australia. Preceding the conference there was an expert panel discussion on elasmobranchs within the Marine Strategy Framework Directive (MSFD), an EU marine environmental policy tool. The discussion was followed by a welcoming reception at Milan’s Civic Aquarium. The following two days of scientific presentations were held at the Department of Biology of the University of Milan. Keynote speaker David Ebert kicked off the programme on the first day with an excellent overview on how to discover and taxonomically describe new shark and ray species. 30 talks were presented in six thematic sessions, and 44 posters in the poster sessions. Themes covered many aspects of current elasmobranch research, such as ecology and fishery, biology, ecotoxicology, conservation and genetic. Guiseppe Notarbartolo di Sciara gave an overview on conservation approaches and measures for chondrichthyans in the Mediterranean Sea in the second keynote talk of the day. The conference dinner was hosted in the Civic Aquarium and an entertaining charitable auction with many sharky items raised fundings for the EEA student bursary. Aside from the scientific programme, public courses for students and families were offered on Saturday and Sunday, as well as a public film screening and discussion panel at the aquarium. On Sunday, conference delegates met for a visit to Milan’s planetarium and natural history museum. Altogether, another successful and exciting EEA conference brought together European elasmobranch scientist and many from beyond, to furthering elasmobranch research and conservation.